Seller has accepted an application! Beautiful home!! 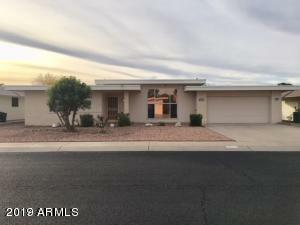 This two bedroom/two bath home is located in Sun City Phase II, one block South of Greenway Road on a nice interior lot. Family room's high ceilings adds to the feeling of spaciousness. In late 2017 the interior was painted, installed new carpeting in bedrooms and installed new vertical blinds in some rooms. N/S exposure with a covered patio facing South. Security doors front & back. Large 2 car garage with cabinets for storage. Near Palmbrook Golf Course, Recreation Centers, Shopping. **Tenants have the responsibility to obtain and pay for their''Tenants Activity Card'' if they choose to join the recreation centers while renting this property. Sun City Rec Center phone number is:(623)876-3000.